The cover is medium with a dewy finish. It does a great job in evening out the skin tone. I am very red around my nose, chin and parts of the cheeks, and this cancels the redness very well. The shades are the normal (for Korean products). The undertone is more to the yellow side with a little pink in it. So, no gray tones (yeah). In the winter time this cushion almost matches me perfect, it is still a little too light but it is easy to fix with a tiny amount of bronzer. They have really nice products and are usually found at dermatologists or spa’s around Sweden. I was actually send this spa kit by mistake from them and I contacted the store since it was another person’s name on it (I did not want the person who was supposed to get the product to be without). There was some weird mistake from their part and I of course got to keep the products. And I thought I would do a short review on them. 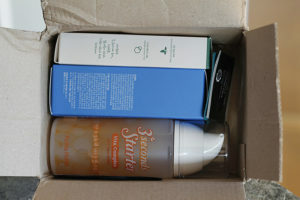 The first time I used it I thought it was really a lot of packaging for a small amount of product. But once you get the product out in the sponge you don’t need much force to keep it coming. The problems with sponges as applicators is that they gather bacteria. This one you can take off and wash, so points for that. Here comes another haul from Beautynetkorea. This is one of my favorite stores to buy from. Mainly due to that the prizes are really great and they always add new products to their website. This product is a fermented essence, which means that it has been treated by the process of fermentation. Braking down larger parts into smaller, more rich in antioxidants, vitamins and amino acids. Since fermented product are amazing for our intestines, what could go wrong with this one.